Would you like score cards for Rubber bridge or Chicago? What lettering would you like personalised on the cover of the pad? 12 characters maximum. First 5 characters are free. The Bridge Score Pad with Personalised Cover is a delightful item! In a choice of red or blue, our skilled craftsmen have tastefully foiled an ornamental design on the covers in gold or silver. In the centre of the design is an oval, perfect for personalisation. We make these special pads uniquely yours by foiling your own special wording in the oval. Lift back the personalised cover and inside you have a selection of score cards to choose from: rubber or chicago. Each pad contains 50 double-sided score cards, which is 100 games per pad. We produce our score cards on 135gsm card. You can give each player their own score card or use them in score card holders. Talented British designer Eric Gill designed the classic Gill Sans font in 1928, which is our choice of typeface for the foiled personalisation. We chose it because of its clarity, style and clean modern lines. Gill Sans is not the easiest font to kern (letter space) with its circular Os and Cs. But our small and exclusive in-house team of artisans are highly skilled at both kerning and foiling. So, with British materials, fonts and craftsmen, our Bridge Score Pad with Personalised Cover truly is a celebration of British Quality at its best. You have a choice of a red or blue cover, and gold or silver foil for the decoration and personalisation. The font we use is Gill Sans in capital letters. Each letter or character is picked from our collection of brass type and set by hand so the longer your word, the more time it takes us to produce. For this reason we charge on a per character basis. The first 5 characters on the cover are free and we charge a nominal amount for extra characters up to a maximum of 12. We can actually fit between 9 and 16 depending on the width of the characters you choose, so if you have a slightly longer word please call us on 01380 829922 and we’ll measure the letters to see if it fits! In rare circumstances, we may not be able to fit 12 letters on the foiling machine (w’s are the widest characters), in which case we will contact you. We can personalise the cover with your company or club logo. For medium size orders we can make bespoke covers for you in a style and covering of your choice. 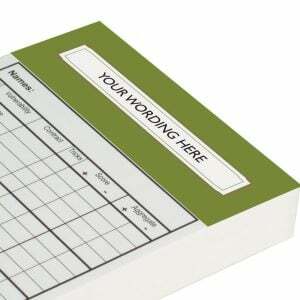 For the larger orders we can even produce bespoke score cards that are unique to you. Please contact us with details of your project and we can discuss the options. We’ve worked with some large and luxury brand names and really enjoy bespoke projects so we look forward to hearing from you!